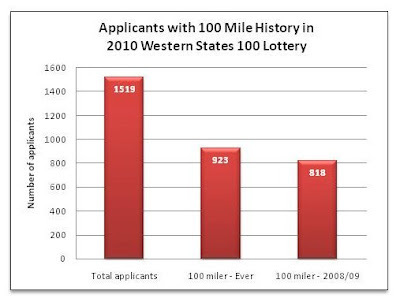 Update: (12-6-09) Post-lottery report on number of lottery winners with 100 mile history (update). Yes, The North Face Endurance Challenge Championship is this Saturday, and despite astounding battles setting up at the head of the 50 mile race in both the men's and women's fields, a good number of us will be shackled to our computers and smart phones not to see if Uli can run down Geoff Roes in the closing kilometers but to see if we drew the golden ticket in the lottery for the 2010 Western States 100 (site). Amidst all the anticipation, there's been a great deal of thoughtful and often fervent discussion about qualification standards for Western. Craig Thornley's most recent post on the the current lottery has drawn over 100 comments alone (post), and for a full immersion in the niceties of the myriad views on the topic, I suggest you read Craig's post and comments. But, one of the perennial issues is whether Western States - the quintessential 100 on the calendar many would argue - should require a 100 mile qualifier rather than the more liberal qualifying standards currently in place. Flipping through the applicant pool last month on Ultra Signup, it seemed to me that a good portion would already meet a 100 mile qualifying standard. So, with too much time on my hands as I work through an off-season injury, I decided to click through the site with Madame Defarge-like tenacity to get a more accurate sense of what proportion of the current applicant pool has completed a 100 mile race in 2008/2009 or at any other time, as found in the Ultra Signup database. A few caveats. This is a slightly blurry snapshot. Applicants were being culled as I was going through, so it was a bit of a moving target. Some applicants clearly showed results for people with the same name. Foreign applicants often listed no results. I assume many of these runners had 100 mile equivalents, but I didn't count them, unless their profile photo showed them finishing UTMB (a very small number). Finally, crashed browsers or fighting kids may have resulted in a few errant clicks on my part. So, what did the numbers show? Out of a current pool of 1519 approved and pending applicants, a little over 60 percent (923) have at some point completed a 100 mile race registered in the Ultra Signup database. Just under 54 percent (818) have completed a 100 mile race recently - in either 2008 or 2009. Exactly what these results would mean for the size of a lottery requiring a 100 mile qualifier is unclear. Yes, the pool would be smaller, but it certainly wouldn't be an easy in. These numbers here are likely an underestimate, and still, over 900 applicants have completed a 100 miler in the past, over 800 of them fairly recently. If a 100 mile qualifier were put into place in a year like this one, it's likely that lottery numbers would still crest over 1,000, possibly well over. The implications this would have on the quality and character of the race, I'll leave for others to discuss. If they can draw 1,000 applicants who have already run at least one 100-miler, it seems to me that the race committee should consider making WS100 a graduate race - previous 100-miler required - to help ease the ridiculous odds of getting a spot. Oh, and congrats on beating the odds! Into the Hardrock lottery for me. Hey, Nick. Thanks. Really sorry the odds didn't break for you today. As I said on one of my Twitter posts: there were a number who were more deserving than I who didn't get in, and you'd definitely be in that category. I wish you the best in the HR spin. Cheers. Nah, everyone who got a spot was as deserving as the next person in the lottery who didn't. Seems like there are a few gray areas in the system, but as it currently stands, them's the rules. If I really want in then I guess I'll have to try and earn it - maybe at Banderra in Jan. We'll see.